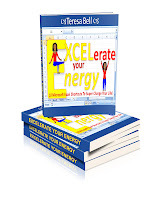 Bell Corporate Development, LLC: EXCEL-erate Your ENERGY!!! Click here to purchase your personal copy. Those who have attended Teresa Bell's powerful workshops wanted to learn what her magic formula was for her constant enthusiasm and unwavering natural energy. Now, Teresa opens up in EXCEL-erate your Energy to share the personal obstacles she faced in a lifeless career, personal life and now to a life that is energy filled with authentic happiness. stuck with a decision that you made that you believe has impacted your life forever then pick up a copy of EXCEL-erate Your Energy today. Teresa's 10 Microsoft Excel Shortcuts to Super Charge Your Life are designed to not only give you mini tips in Microsoft® Excel® but also give you the formula to success and happiness however YOU CHOOSE to define it. Each shortcut has a Energy Boosting Exercise to keep you motivated and on the right track.